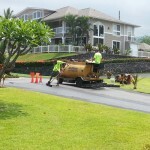 Asphalt repair is important for your business. You want to make a good impression on anyone who visits your business. Good upkeep of the physical plant with parking lot repairs sets the stage for everything else. 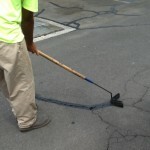 Filling cracks in your asphalt driveway or parking lot surface is a very important part of extending the life of the asphalt surface. 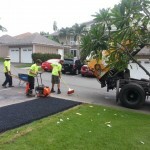 This prevents moisture from penetrating the asphalt surface, and keeps vegetation from growing in the cracks. 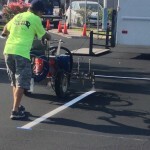 Your parking lot striping wears away over time, which is why re-striping is the most common and routine type of asphalt maintenance. As soon as the paint is applied to your parking surface, it begins to deteriorate. Like the cover of a book, the exterior of your building and parking lot are what your customers base their first opinions on. I know, “don’t judge a book by its cover.” Well, guess what? People still do. That is just the way it is. And you only get to make one first impression, so it is important to make it a good one. After all, who wants to lose business because their parking lot is a mess?